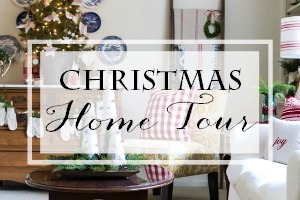 Welcome to my first Christmas home tour. If you are new here, I’m so glad you stopped by. If you’re a dear old friend, thank you for another visit. I hope you enjoyed your look into our home. red than I usually do and after much indecision I decided I liked it! Thank you for taking time out of your day to visit me…come back soon. Your home is lovelyand tasteful. I would love to know where you fou d your. silver champagne buckets . I haven’t been able to find any locally in Idaho. Thank you! So, so wonderful! Really enjoyed the tour…your attention to detail is exquisite…thanks for sharing! Your Holiday Home looks lovely and welcoming. I used your idea with the white wooden tray on the coffee table. I had one (painted blue), repainted it and set it up on my old pine trunk, which is my coffee table. I polished my silver candle sticks, used red candles, added a Christmas cactus set in a Longeberger cache pot, added some tiny Christmas story books…..and voila! Thanks so much for the idea. 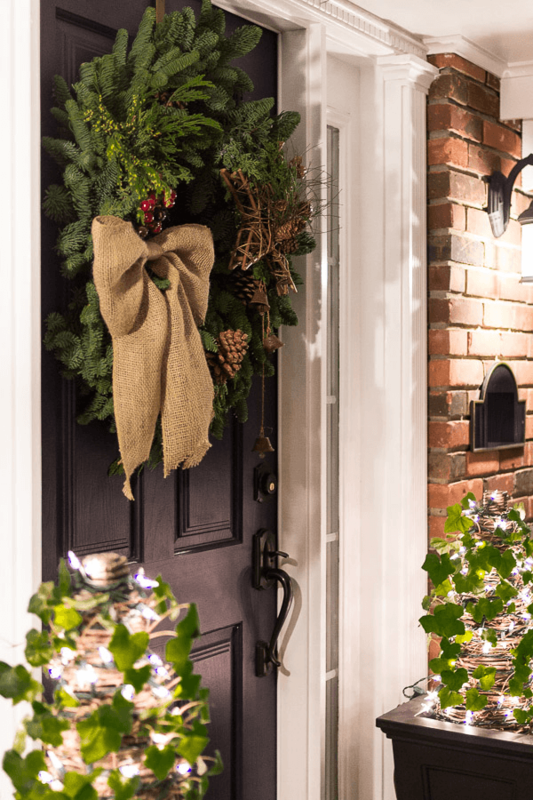 Your holiday decorated home is sparkling and beautiful! Ann, everything is just beautiful. It’s so easy to go overboard (ahem – that would be my problem) – you always seem to find the perfect balance. I love your bannister again this year! I have to tell you that your bannister from 2012 was the inspiration for mine this year. :) I hope you have a wonderful Christmas, and thanks for all of the good things that you share with your lucky readers. Your home tour is beautiful. I love the simplicity of everything, seeing homes that are overdone make me feel almost claustrophobic. But yours is refreshingly simple and lovely. And I love the red with the beautiful yellows of your home. Really gorgeous! Kelley looks like he (?) is protecting your home. I don’t think I would want to pick a fight with him. Very nice and tastefully done. I especially liked the entry and front porch. Also thanks for including instructions for much of your decorations. Just lovely…. I feel like your designs are my alter ego as I always think, “that’s it… that’s perfect”. If “copying is the greatest form of flattery”, then you should be completely flattered. Thanks for sharing you ideas, creations and designs. 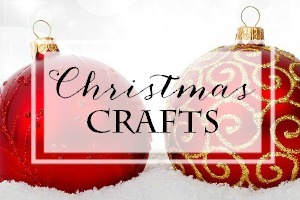 Your ideas make many homes more homey, inviting and festive. Love what you do. Wow, wow, wow, Ann … absolutely incredible! 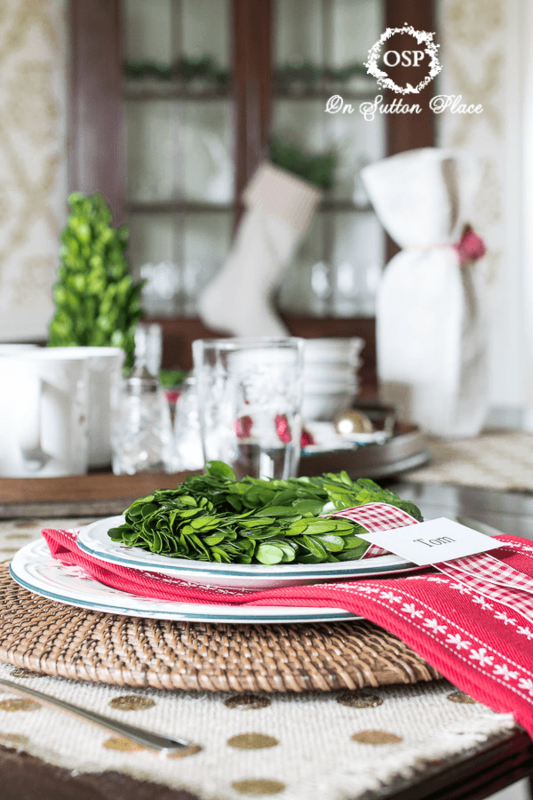 Your front porch is so inviting … your splashes of fresh greens and pops of red are beautiful throughout your home! 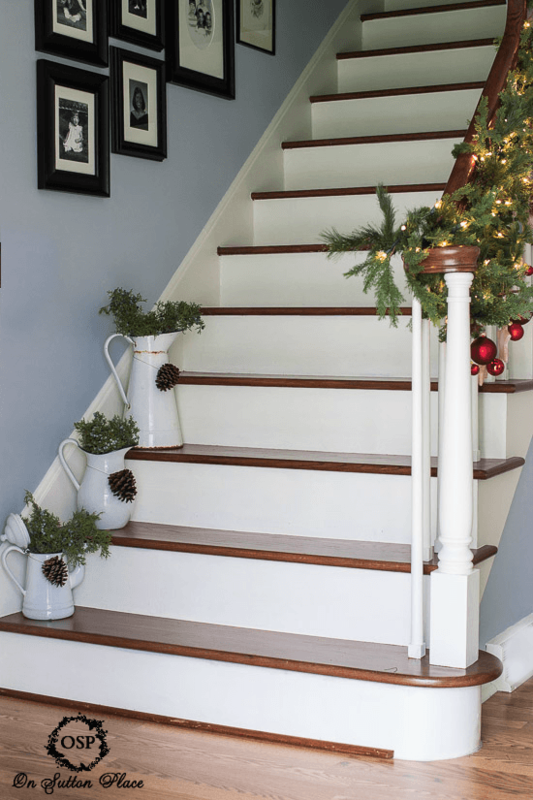 I love your staircase garland … and the “JOY” plates, mixed in with your blue and white plates, are fabulous! Gorgeous vignettes and amazing photography! Lovely home. Kelly is very sweet looking. I always look forward to your post. Your home is beautiful! I love all of the Christmas decorations- so cozy! PLEASE tell me what the blue paint color is in your entry way! My husband and I have been debating on a blue for our living room and can’t seem to find the right shade. We both LOVED the color you chose! Thanks! Sorry it’s taken me all week to answer this question…I am so behind! The paint color in the entry is Sherwin Williams Upward. It is a clear and very pretty light blue. Merry Christmas Aubrey! 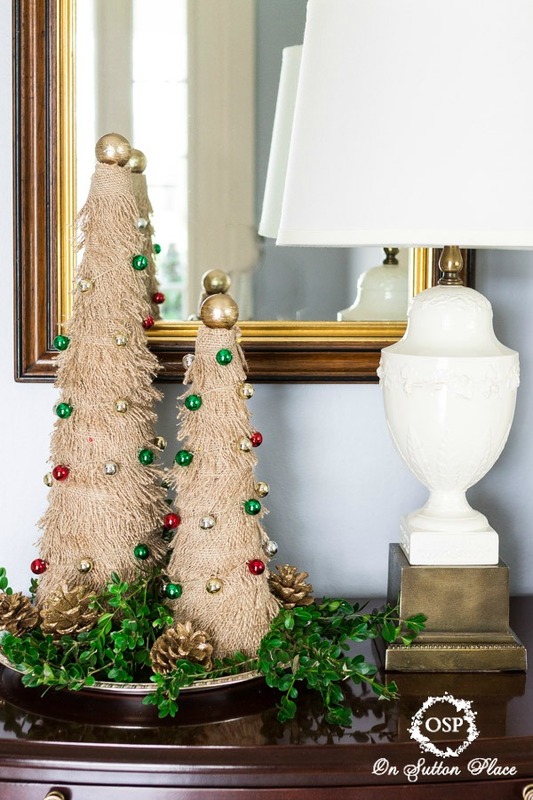 Ann, your have just the right balance of Christmas cheer throughout your home. But my favorite picture(as always) is the one with beautiful Kelly. Very lovely,Merry Christmas! I enjoyed the peek into your home. Greetings from cold Chaska, Minnesota! I enjoyed seeing your Christmassy home tour. I loved how classy, classic, yet simple, you’ve kept everything. Your Nativity set is sweet, I love that it’s all on a tray- are the pieces glued to the the tray or simply placed there every year? And where did you find those HUGE pinecones? I’d love a few of them, even if just to shock the neighbors. We have lots of trees and forests here in MN, but I’ve NEVER seen any that big! I wish you and yours a blessed Christmas and happy new year. I’m so sorry I am late in responding to your questions! 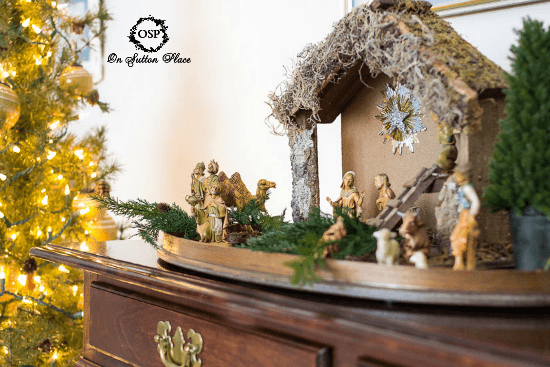 No, the Nativity pieces aren’t glued to the tray. I just set it all up and hope nothing falls over! 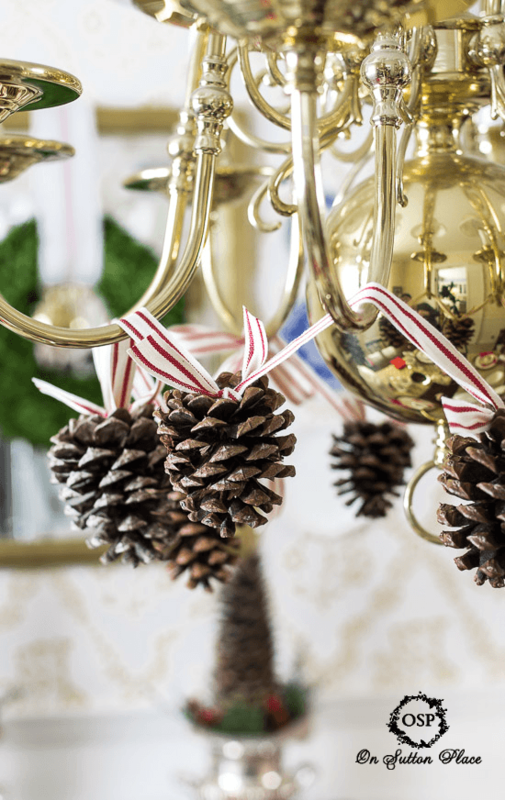 I got the big pine cones a few years ago at Hobby Lobby and I saw them there again this year. They are getting a little dry and starting to crumble so I will most likely have to replace them next year. Merry Christmas Vicki! 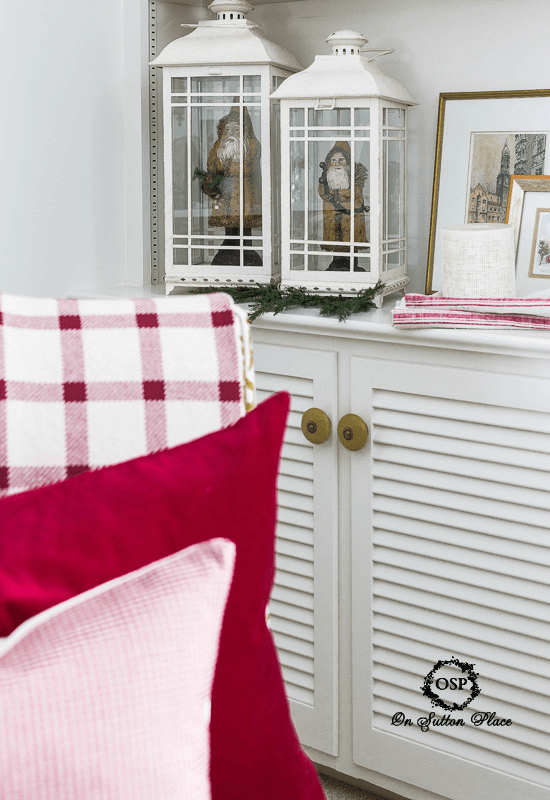 Beautifully decorated home…simple and elegant…love the natural elements and touches of red..I love the Classics when it comes to Christmas decor. 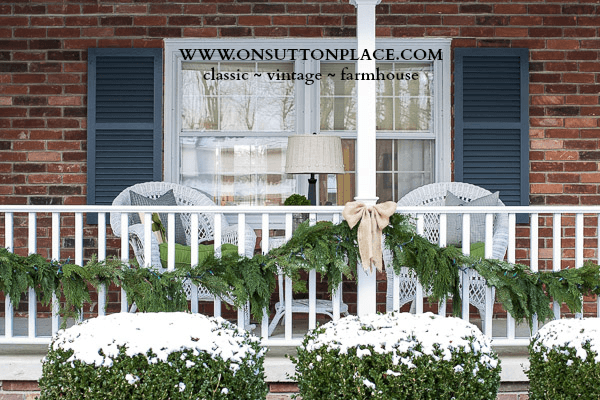 I find myself “sharing” your ideas many days in a group page I belong to called “Home Decor Lovers”…Looking forward to more of your ideas in the New Year! Your home is beautifully decorated, Ann! It’s simple, yet elegant. I love it! Your home looks so beautiful, Ann!!! 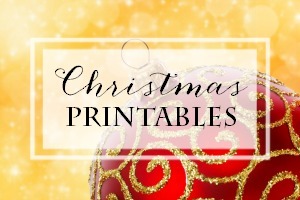 All of your lovely Christmas touches are perfection! 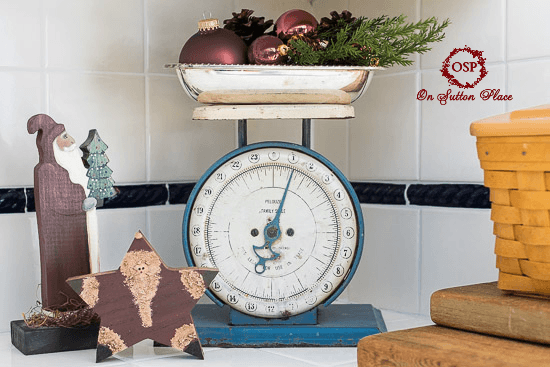 Loving your vintage blue scale in the kitchen!! 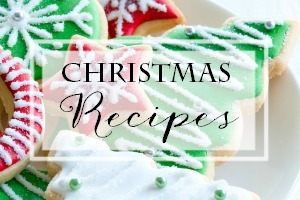 It looks amazing – so festive and fun. You’ve motivated me to finish my decorating today!! Your home is stunning, Ann! Elegant yet comfortable… I love it all. And your photos are just perfection! Hope to catch up with you soon! Your home is beautiful !!!!!!! A wise decision to incorporate touches of red, it makes everything “pop”. 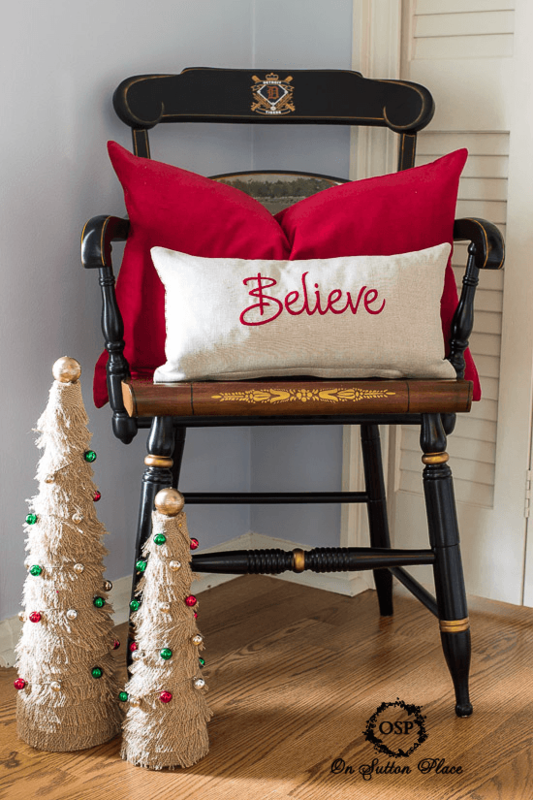 BTW, I love the pompom Christmas tree pillow, so cute. Your home is always so pretty. LOVE your vintage farmhouse style and the mix of colors.Great look with the pitchers on the steps and Santa in the lanterns. It’s all so warm and welcoming, Ann. 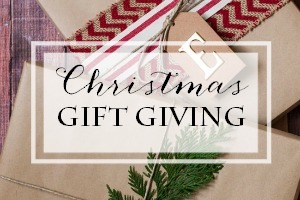 Happy day tomorrow…the mini grain-sack stockings I ordered from you are due to be delivered. Joyeux Noel! Gorgeous! I found your website via pinterest. I really love all of the natural touches in your decor and I would love more details on your banister garland!! Hi Malea! 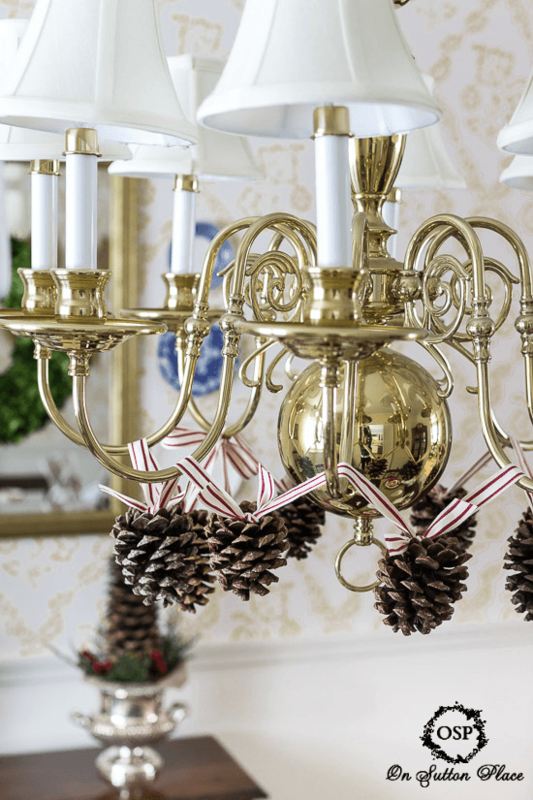 The banister garland is not real. I got it years and years ago at a local shop. I actually have a wreath that matches. At the time, I couldn’t afford it and felt very guilty for buying it…but now I am so glad I did! 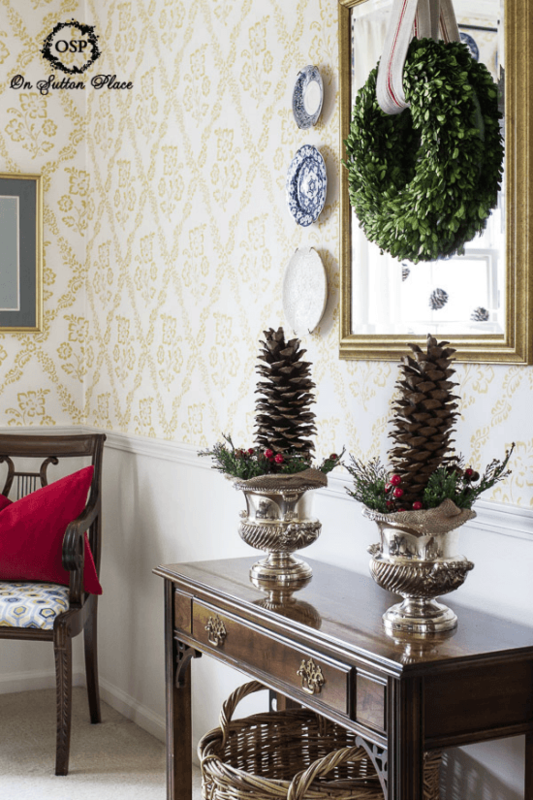 You could recreate it by buying a basic pine garland. 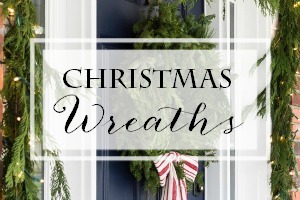 Then look for “picks” of cedar and other greenery that look “real.” Wire the pics in and your basic garland will look much fuller. The little stars are from a local shop too but you could make them from felt by just fusing 2 pieces of felt together with fusible webbing. Then cut out stars and attach the strings to hang them. I put the red balls right on the same strings as the stars. Actually that’s what took the most time. lol. I hope this helps…I may do a very quick tutorial on the felt stars. I have had a lot of questions and comments about the stairway so it would be a good idea. Merry Christmas! Beautiful home. Beautiful decorations. Beautiful projects. Thanks for sharing such inspiration with us! Beautiful! And I noticed that you have the same china pattern as I do…Noritake Adagio! Yes! Oh my gosh. I hardly ever use it but still love it after 32 years. Thank you for your comment! So refreshing to see your decorations. I am older too with now kids at home. I too decorate in a more casual way and no Santas, toys, and busy decorations. I love that everywhere you look there is a small decoration waiting for someone to smile at. It is so homey and confortable. Hey, have a wonderful holiday. Thank you Lisa…such a lovely comment! I love it! Makes me feel at home. You have done a beautiful job. Have a Merry Christmas! Beautiful . 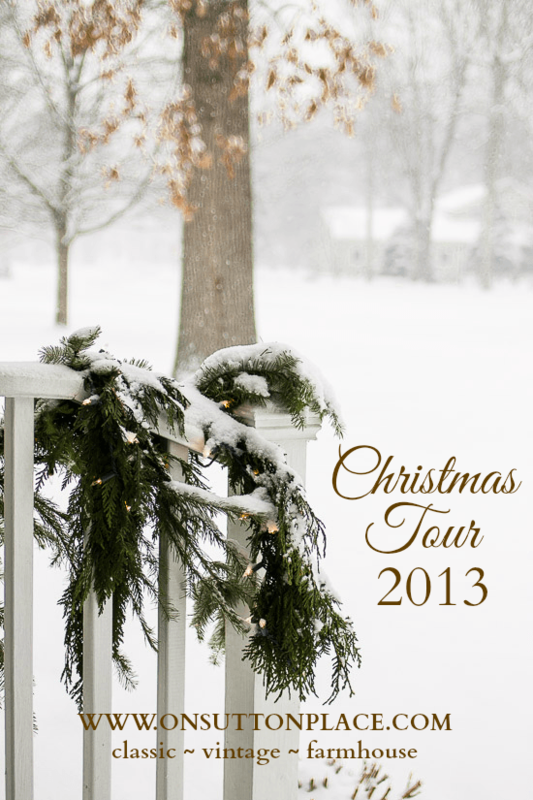 I love the picture you used for christmas home tour 2013. 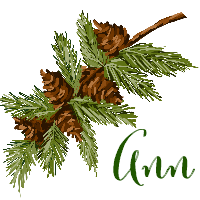 Ann, i love the burlap fringe trees, and the bannister too. Everything is gorgeous! A great home tour for sure. Absolutely stunning! You know what I like? It’s not over the top; it’s real and I love it! I hope in the new year to get one of your beautiful pillows! Thank you so much for sharing your home and your talents! 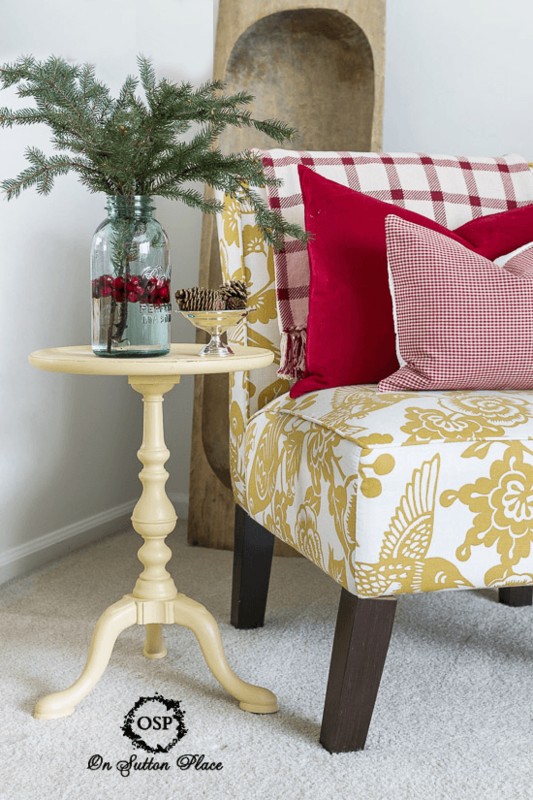 Love your home and your exquisite taste in decorating…just beautiful! 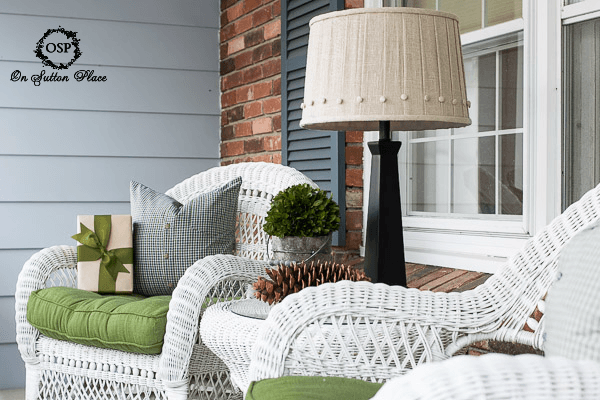 LOVE LOVE LOVE your home…it is absolutely gorgeous!! May I ask where you got the white lanterns? I have been looking for ones just like that!! They used to be available on amazon.com but I think you would be better off ordering them directly from this link. You will love them! I’ve had mine for years. LOVE the addition of red!!! Thanks for the tour – so much to see – so much to like! 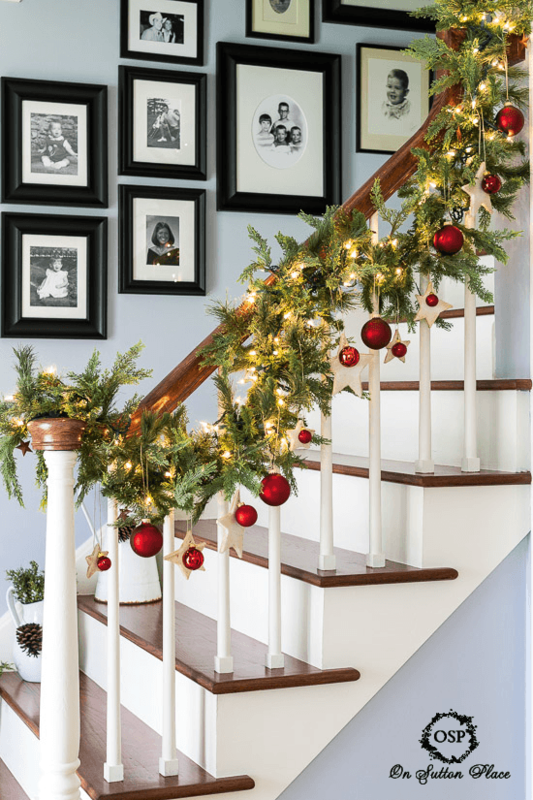 Love the garland on the stairs as others have mentioned – love all the pretty pillows – love everything! Everything looks beautiful Ann. Love your style and the red touches are just perfect. Ann, your home is just absolutely lovely. I always think it is beautiful, but it is at pinnacle in its Christmas finery. Thank you for inviting me into your holiday home. My Holiday Home Tour will resume tomorrow and continue the remainder of the week. Ann it is all so gorgeous. I still think my favourite is the evergreen swag and red balls you put on your railing in your front hall. I hope you are hosting Christmas dinner so everyone can enjoy the finery. Beautiful Ann! I enjoyed looking at your home all dressed up for Christmas. I especially love the garland on the staircase with the ornaments hanging down. Wonderful idea! Your home is beautiful, thanks for sharing. Beautiful Ann – and who knew I had a cute dog with my name! Everything looks just beautiful, Ann! So bright and fresh! Wonderful tour. Thanks for sharing. Merry Christmas! So beautiful! LOVE the snow… perfect timing!!!! Hi Ann, Everything looks so lovely, so fresh, so sweet! Love your style. Happy Holidays! It all looks perfect, Ann! I love the pops of red!! So warm and classic and not overdone. Thank you for sharing. Ann, your photography is stunning and I love all your touches of red this year! The snow fell just in time, didn’t it? The perfect touch, so beautiful!! I like the pops of red you used, and enjoyed looking around with all the photos. It was nice to look and not read. Great looking Christmas decor, it is beautiful. 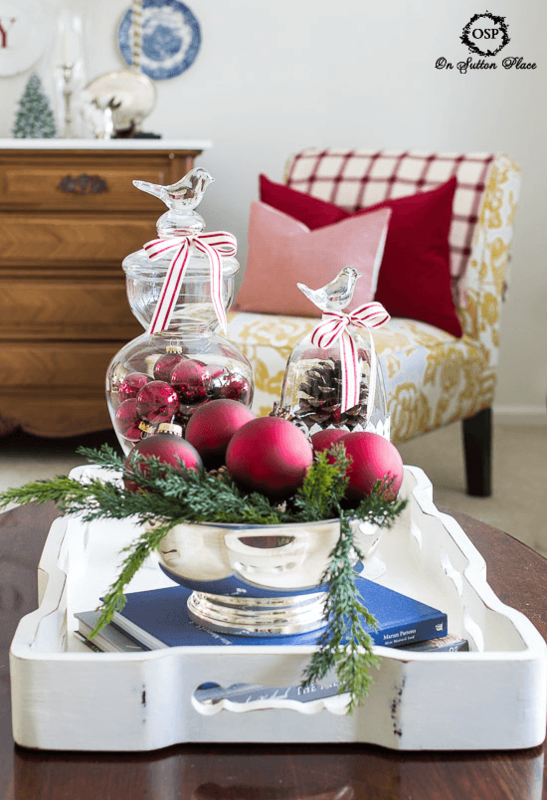 So very pretty – I like simple and beautiful red inspired Christmas decor. Thanks for sharing! Absolutely stunning and classic, as always! I’m so in love with those place settings. Every detail is perfect! Ann, I love all your simplistic, classic touches. Just beautiful. Thanks for sharing. Your home is so lovely, Ann. I liked the pops of red. 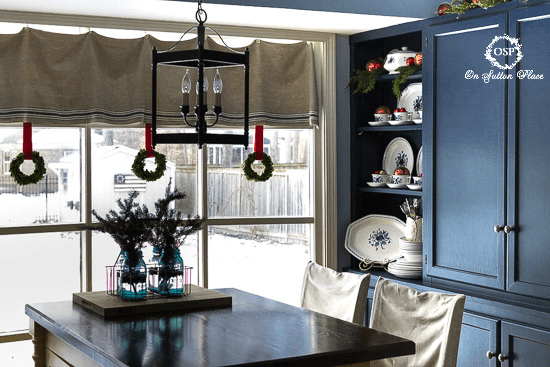 And your kitchen … oh my, that blue! Merry Christmas, dear blogging friend. It is all so beautiful, Ann. That snow pic is so gorgeous! 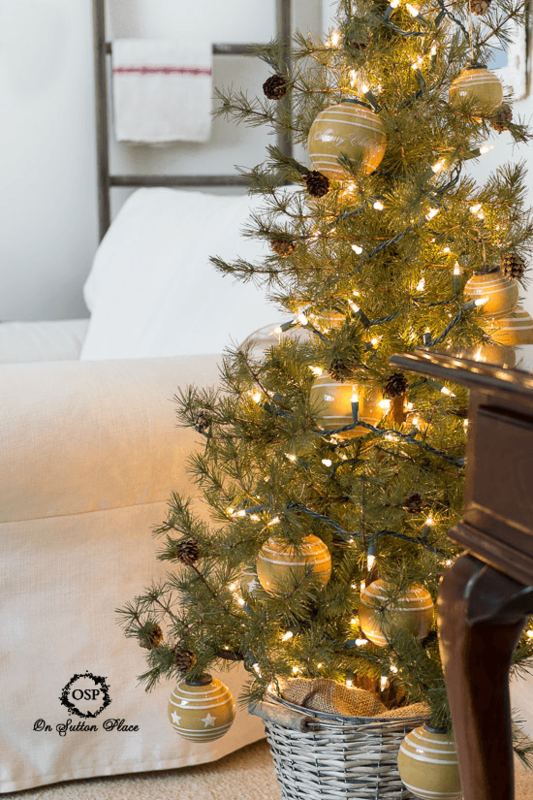 Your Christmas home tour is simply stunning! And I just adore, adore (and pinned) your amazing staircase garland! Serious adoration going on over here!!! Ann your home is beautiful! Your photos are amazing too! Absolutely beautiful!! I love all your touches. So pretty and natural looking, like it is there all year. You have definitely inspired me to do more. Thanks so much for sharing your home with us. Pinned and sharing!!! Oh Ann, everything is just so classically beautiful. 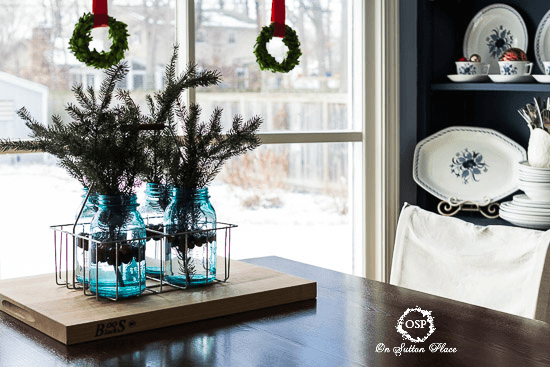 I love the cranberries floating in the mason jar with the pine boughs and the enamel ware pitchers with the evergreens and pinecones. I sure enjoyed my tour of your gorgeous home! Ann your home looks gorgeous! WOW!